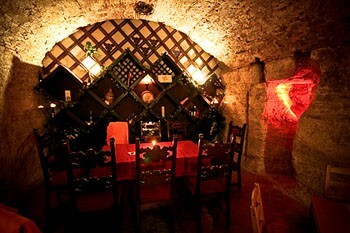 Taste wonderful Hungarian wines in a historic wine cellar in Buda castle. and Badacsony north of Lake Balaton. Wine Tasting in Faust Cellar is Currently Unavailable! Please Consider the Following Programs Instead! Note: The cellar is open on 31. December/New Year’s Eve. 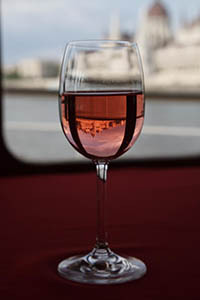 TIP: On Closed Days book a Wine Cruise on the Danube with 7 Wine Samples and a 1,5- or 2-hour tour on the river. The tasting lists (see below) include some wonderful wines from Hungary’s top wineries. The Wine Cellar offers a wide selection of Hungarian wines from the country’s best wine growing regions as well as traditional fruit distillates called pálinka in Hungarian. 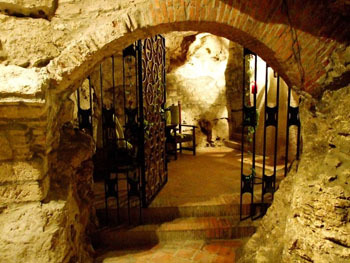 The stone cellar is part of the vast labyrinth system winding underneath Buda castle. The inhabitants of the castle carved the labyrinth out of the chalk stone to provide escape during a siege in the middle ages. On the way to the cellar you can view the restored remains of a 13th century Dominican cloister and monastery. 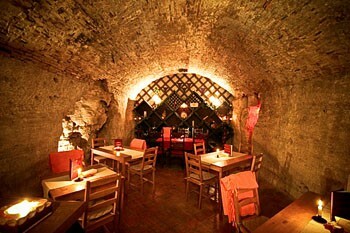 The cellar exudes quaint, relaxed atmosphere: a perfect and romantic setting for wine tasting. Kind and knowledgeable, English-speaking wine experts will introduce you to the wines and wine regions of Hungary. 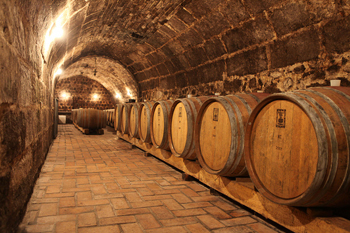 You’ll learn about and sample the best local wines in a private cellar. 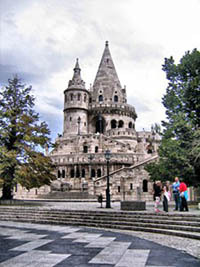 The whole Castle District with its ample historic sights and wonderful panorama of the Danube, and Pest are part of UNESCO’s World Heritage Site. Wine was always an essential part of Hungarians’ life, and the Buda Hills used to were covered with grapevines and well-known for wines. By tasting some of the country’s best wines and pálinkás in the vaulted stone cellar, you’ll get a more complete impression about Hungary, and the Hungarians. Szekszárdi János Áldás (John’s Blessing/Johannestrunk, János Hetényi Winery) 2006: – a red madeira-type dessert wine: high alcohol content paired with creamy cocoa mouthfeel, with notes and aromas of dark chocolate and prunes. Balatoni Tramini (Brazsil Winery) 2012: a nice light white from the lake Balaton region (northern shore, Balatonfüred-Csopak area) with notes of peaches and a creamy mouthfeel. Somlói Juhfark (Winery of Bálint Barcza) 2011: vivid with notes of herbs, nuts and lemon pith. Nadapi “A” cuvée 2012 by the Szentesi Winery a dry, white fruity white from the Etyek-Buda wine region. John’s Blessing (János Áldás/Johannestrunk) 2012 by Bene Winery Tokaj – a crispy dry selected furmint. According to local belief John’s wine has medical qualities, it keeps away malign spirits, protects from lightning, helps maintain beauty, health and keep up good marriage. Tokaji Szamorodni Dry 2005 (Bene Winery): – and exciting dry white specialty from the famous Tokaj region: walnut, almond, and hazelnut notes are in nice harmony with the fine acidity. Balatoni Irsai Olivér (Brazsil Winery) 2012: a fruity white by a small-scale wine estate in the northern shore of the Lake Balaton. Tokaji Édes Kettes “Sweet Harmony” 2011 (Bene Winery: – a sweet furmint blend form Tokaj. Móri Ezerjó “Aszu” (Bozóky Winery) 2006: – and finally a lesser-known unique, dessert wine from the Mór wine region: a rich golden yellow sweet wine with scents of honey. A shorter menu of 5 fine whites is also available. A package that includes tasting of wines (both reds and whites) from all of the country’s major wine producing regions: Szekszárd, Eger, Tokaj. Each package offers a choice of a longer (consisting of 8 items) and a shorter (5-6 items) tasting list. No need to create a PayPal account! Note: Please check your spam folder because sometimes confirmation letters land there. If something comes up and you decide not to do the wine tasting please cancel it at least 7 business days prior to the date of the tasting to get a partial refund. No Show Policy: If you don’t cancel and don’t show up for the tasting you are not entitled to any refund. Contact us to cancel the tasting. 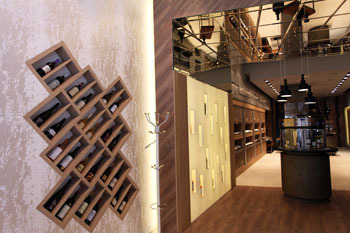 TIP: If the cellar in the castle is fully booked you can taste wines in the CultiVini Wine Gallery & Shop in Pest city centre. Wide selection of Hungarian wines from the 22 wine regions, from common to rare bottles, unique items to sample from state-of-the-art tasting and preservation machines! You can also buy wines with delivery to your home. Sommelier guiding (reservation is required), mobile and tablet apps with extensive information on the wines, wine makers, varieties, with tasting notes. A one-of-a-kind experience! 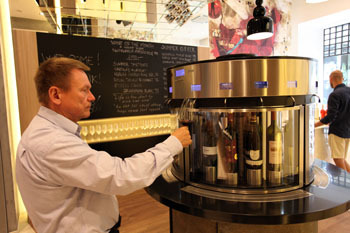 Browse also our list of the top wine bars in Buda and Pest!